Presented in this informative text is a concise, clear picture of the fingernail, its anatomy, what affects its health, how to combat weak nail problems, how to obtain strong, healthy nails and what products to buy. Included is an analysis of all currently available artificial nail systems (acrylics, wraps, gels and glue on tips) with a discussion of the potential health risks involved. The Guitarist’s Guide to Fingernails also introduces a revolutionary new artificial nail system that is nontoxic, removable yet effective, with no risks to the health of your natural fingernail. 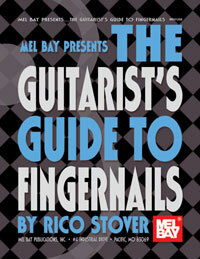 An absolute must for guitarist’s of all kinds!